Which class, clinic or workshop will work best to help you meet YOUR goals? This HIIT (bootcamp-style) class is designed for MAXIMUM calorie burn in the shortest amount of time. 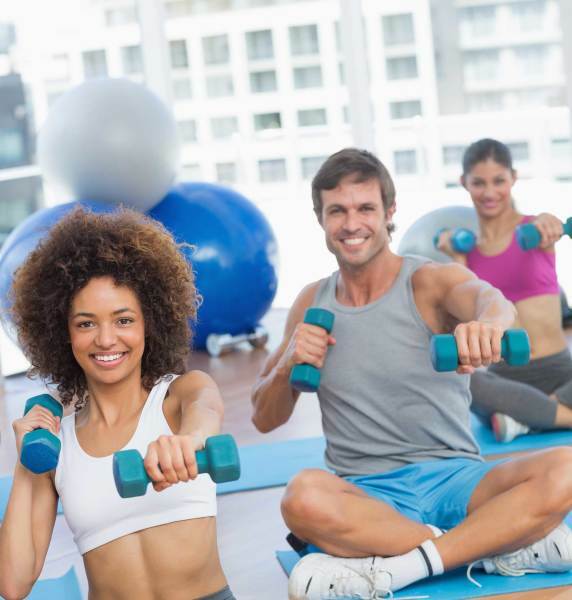 In this high-intensity class you will challenge your fitness while having FUN! In less time than you could make a shopping trip to Costco, we will sweat through a combination of strength, cardio, muscle endurance, flexibility, core, and functional movement patterns. You get EVERYTHING you need in one workout - what more do you need? You will be moving and burning fat throughout the class, but even better than that, you will increase your metabolism so you will keep burning fat even after you’ve finished working out (we call this winning)! The exercises are simple yet effective, meaning you can rock this class even if you’re not the most coordinated. *Offering 30 minute HIIT Express for those in a time crunch, 45 and 60 minute HIIT options as well! We hope you’ll bring some friends but we guarantee you’ll also leave with some new ones in this positive, encouraging environment where we will all challenge each other to reach our highest potential! *This class is suitable for all levels, as modifications are available to accommodate most. Postpartum and pregnant moms welcome (please advise, so modifications can be provided). This 45 minute "no-impact" class will be joint-friendly and will focus on stretching to improve flexibility, stability and balance, and some basic toning and strengthening. If you have joint mobility issues, want to improve your flexibility and balance, and improve your strength with some basic movements this is a great place to start! This class will be a great way to wind down your evening, and get your body loosened up. We will warm up with some dynamic stretches, do some low or no impact strength work, work on stability, and end with at least 20 minutes of flexibility and mobility work. Our Couch to 5K running program will provide lots of information and motivation to get that first 5K under your belt in a non-intimidating environment. Also offering 10K and half marathon clinics to take you to that next level! Follow the link below to learn more about what's currently being offered! NEW! Virtual run clinics available to start any time with one on one individualized programming! Basic fitness classes of all levels can be taught at YOUR special event for a flat fee and tailored to your audience. Please contact me for additional information and availability!